The morning dawned supper soggy, necessitating a shop day rather than on site. We had plenty to do including a clean and reorganize of the shop. The Bucky sign was carefully loaded into the trailer for delivery when the rain abated just a little. After lunch the rain quit for a bit and four of us made a run up to the lake to make a very special delivery. 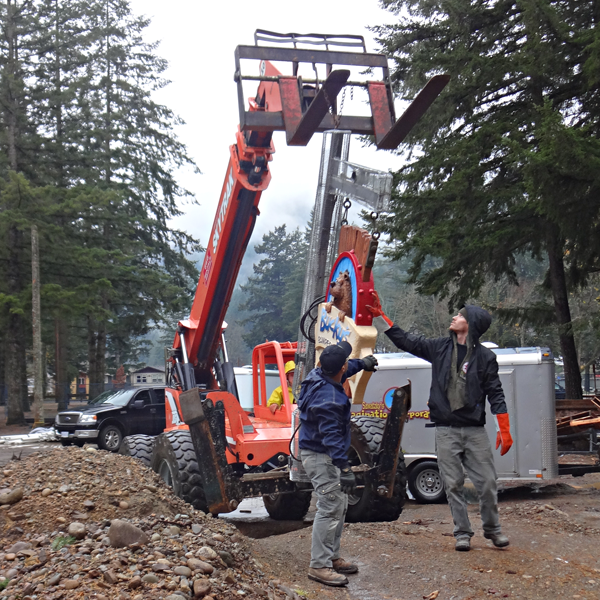 The first sign for the adventure park was to be installed. The sign post still needs mudding and carving but that will wait until the railing is installed. I love it when my client has the necessary equipment to handle our heavy installs. Chris has pretty much all of the lifting equipment we need. Today, the zoom boom was the equipment of choice. We unloaded the sign from the trailer and hooked it up to the rugged lift. The skilled operator shifted into four wheel drive and low range and the install began. The signpost was carefully positioned over a sleeve that had been structurally positioned onto the concrete wall. Then we lowered it into position. We then adjusted the sign vertically to make sure there was plenty of headroom on the walkway below and once we were happy Bert permanently welded it into position. then it was a simple matter of climbing to the top, unhooking the chain, twisting out the eye bolt and we were done! One sign is complete! Then it was back to the shop to continue our work there. Jenessa did the bulk of the lighthouse roof and did a great job carving the shingles into the fresh concrete. That makes this piece ready for paint next week after a little curing.